The Evergreen Foam Sleep System - Is a FIRM handmade green sleep system at a great price. the Evergreen foam topper made with a 2" foam core wrapped in Pure US Wool and encased in a 100% cotton casing. 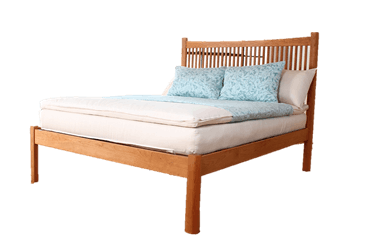 Evergreen Foam Mattresses are Handmade in the US by White Lotus Home. You can buy these separately as well to upgrade your current sleeping surface. This eco-friendly foam mattress system has been very well received by our customers that want a conventional mattress style look but want to sleep on a Natural environment. For those looking to invest in your personal health while keeping the environment in mind, this is the sleep solution for you! We recommend putting it on a box spring set or platform bed, or even using it as a floor bed. A slatted bed frame is recommended for air circulation and the slats should be at least 2.5" wide and no more than 2" apart from each other. When the slats are more than 2" apart, that may affect the longevity and comfort of your mattress.